Former Iranian Foreign Minister Manouchehr Mottaki has called his sacking last week during a tour of Africa "un-Islamic" and "offensive". No official reason has been given for his dismissal, although observers have suggested it was part of a perceived power struggle in Tehran. There was more criticism of the move on Sunday from Iran's parliament speaker. Ali Larijani, seen as a close ally of Mr Mottaki, told an open session of parliament: "The right way was that the change should have happened with prudence and observing dignity and not during the visit." 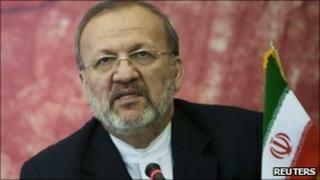 Speaking to the Mehr news agency, Mr Mottaki was critical of the way his dismissal was managed. "Sacking a minister while on a mission is un-Islamic, undiplomatic, offensive and outside the practices of politics," he was reported as saying. "I was never told about the appointment of a new person within 24 hours of my departure for the mission." Mr Mottaki also said he had not been told about a function being held on Saturday to officially introduce his replacement, nuclear chief Ali Akbar Salehi, even though the event was also supposed to be a farewell ceremony for him. This was ridiculous, he said. However some senior officials have denied his take on events, insisting that Mr Mottaki had been told ahead of his trip that he was going to be replaced. Mr Mottaki, sacked on 13 December while in Senegal, was appointed foreign minister in 2005. In a letter to Mr Mottaki, the Iranian president told him "I appreciate your diligence and services as the foreign minister," the independent Mehr news agency reported. Correspondents say there has been mutual distrust between the two men since the 2005 election that brought Mr Ahmadinejad to power: Mr Mottaki was campaign manager for Mr Larijani, a rival of Mr Ahmadinejad. Analysts say his departure from the foreign ministry rids President Ahmadinejad of a critic at close quarters, but the move may yet cause problems in a parliament that is increasingly unhappy with the presidency.